Writing about the beginnings and evolution of transport technology means looking back and getting as far as upon the threshold of human civilisation, for even the most primitive vehicles played an important role in all spheres of human work, in all epochs and in all countries. 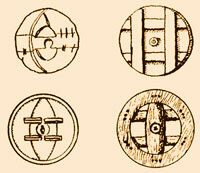 After all, the wonderful relationship between the wheel and the mankind has existed from the outset of human culture. The question of when the first wheel on an axle really appeared on our planet will probably never be answered. 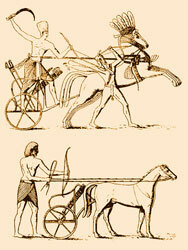 Archaeological research finally proved that some simple two-wheel carts existed more than ten thousand years ago. Drawings on the rocks in the north of Europe, primitive toys and models found in China, India and other areas where ancient cultures developed, keep pushing the date of the miraculous invention of the wheel further back into the past. The technological progress advanced from old two-wheel carts with solid wooden wheels, which we can see in the textbooks of history, across light chariots used in ancient times both for racing and in battles, up to luxury coaches, diligences and fast stage coaches. There were many different circumstances in the history of mankind that contributed to the their quick development. Among them, it was first of all agriculture, the most important sphere of human work in all ages and all parts of the world. The growth of trade and frequent war expeditions also played an important role, as they did in the development of nearly all revolutionary technical inventions. The vehicle was so significant for ancient cultures that it was a custom to bury great warriors together with their battle chariots, as we have learnt from the archaeological discoveries of the graves from the Bronze and Iron Ages. Discoveries of votive bronze carts, which were used in religious rituals, are also very interesting. They were found all around the world and also in our country, namely in the cave called Býčí skála, or near Milaveč in the region of Domažlice. 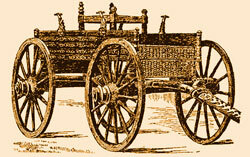 The primitive carriage of the ancient times was protected by special laws. In Rome, for example, the peasant's carriage, being used for taking the harvest in and therefore regarded as an article of everyday use, was so protected that the creditor was never entitled to take it away from the debtor. This privilege of ancient Rome was still valid during the reign of the French king Charles VIII in the 15th century, and even when the king Luis XIV ruled in France in the 18th century.